Look at the mulberry tree! The branches are just loaded with fruit this year, and I want to be sure to collect enough for some syrup or juice or something. You can see that the berries are starting to ripen. The purple-black fruits are the ripe ones. The birds have been screaming at each other and fighting for control of the tree all day. So I thought it might be time to start collecting berries. This picture may be hard to figure out. 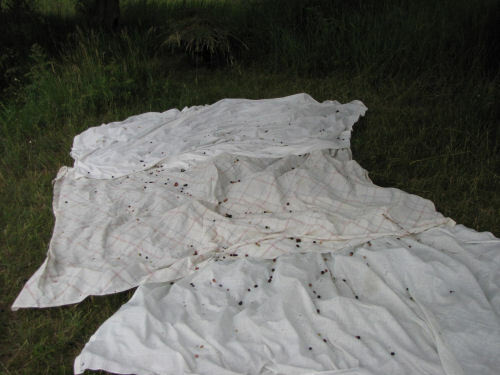 The best way to collect these fruits is to put old sheets under the tree and then shake it. That's what I did, but hardly any fruits came down, and a lot of the weren't the dark, ripe ones. This means I'll just have to try another day. Tomorrow is supposed to be hot... that might ripen them right up. 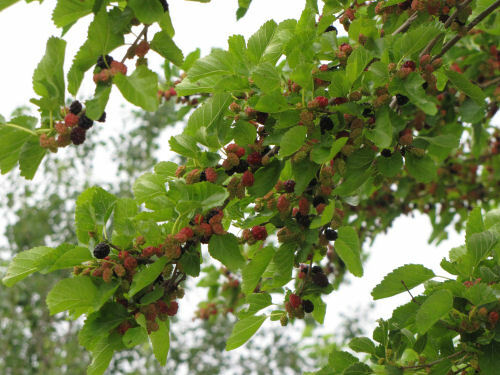 This mulberry thing is a really messy project, but it looks like such a good year for the fruit I'm hoping to do it. I'm too tired to function, so will just post and go to bed. Sorry, I'm not responding to comments. Maybe I can get caught up tomorrow. 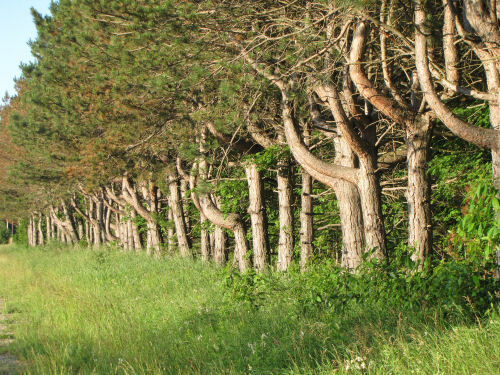 Just two groups of trees from my ramblings of the day (paper route and then my own job). I think the one above is a cathedral choir, but the one below is all gospel, don't you think? I have to get to bed- day 3 of paper route coming up. Here's a lovely Red-Spotted Purple Admiral butterfly intergrade. 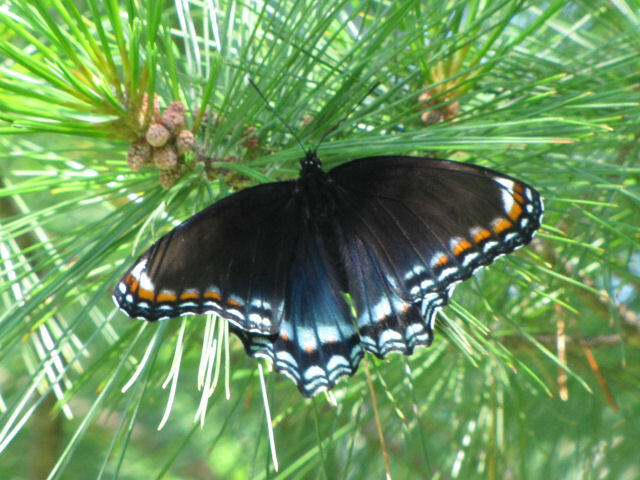 It's known as an intergrade between the White Admiral and the true Red-Spotted Purple Admiral. Scientific name is Limenitis arthemis astyanax. This is a backwards before and after. The better one is "before." Wait, you are thinking this is supposed to be a positive blog. Well, it is. The positive thing has to do with my plans for this summer. But first, the pictures. 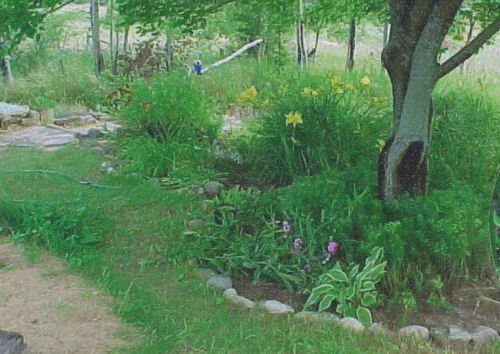 Here is my lower flower garden in 2003 looking toward the house. And the view of the same garden from the other direction. I'm hoping this wasn't the last year that it really looked good, but I can't prove it with pictures since then. Are you ready for the bad news... the "after" as in, now? These are the same views. 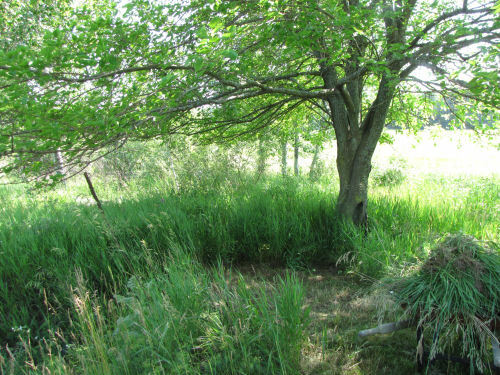 You can just see a little clear space where I've started trying to find the garden. I know that absolutely nothing was done there for the past two years because I was off hiking too much. But this summer, I'm just going to enjoy playing in the dirt when I can. I've got the front beds cleaned up pretty well, so now I get to find out what's still alive down in this bed. The soil is terrible, almost all the plants I have I got for free, and the deer and rabbits are murder on it (literally). But I have fun. So that's the quality item. I am staying closer to home this year, so I'll be spending some time on this mess. We'll see what I can recover. 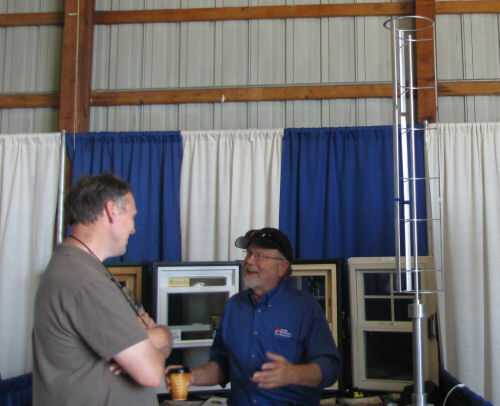 The Michigan Energy Fair is presented each year by the Great Lakes Renewable Energy Association. 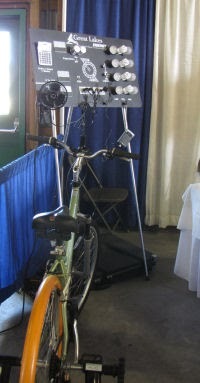 It moves around the state, but was held at our country fairgrounds this year. Volunteers got a free entry and a t-shirt, so I agreed to chip in a few hours. When it was last on this side of the state I kind of wanted to go, but never made it. Here are some highlights from this year's fair. There were displays of both homemade and professional products. The one above was a wind turbine which powered something, but when I went over there, no one was around to explain it. This system is totally new to me. These tubes are vacuum sealed and concentrate the heat from the sun. That heat is transferred to a home heating/ water heating system through a heat exchanger. It's supposed to be able to reduce those costs by 60%, even in Michigan, with a 5-year cost recovery. If we had the money, I might be interested enough to explore this one more. 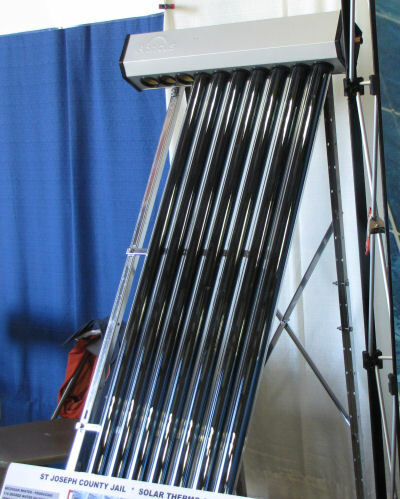 The open vertical column on the right is a small model of a vertical wind turbine called Windspire. These are made in the county just north of me. I've seen some full-size installations of these. They work well for small businesses and aren't as visually obtrusive as the large "propeller" towers. Each one can generate 1200 KW of power. This was clever, but it wasn't working when I was there. You could ride the bike and see how easily you could generate enough electricity to light the LED and fluorescent bulbs, and how difficult it was to light the incandescent bulb. I tried it, and the fan comes on first- to cool you off! I was waiting for the lights when another of the helpers said that the lights weren't working. Bummer. It was a great educational demo. 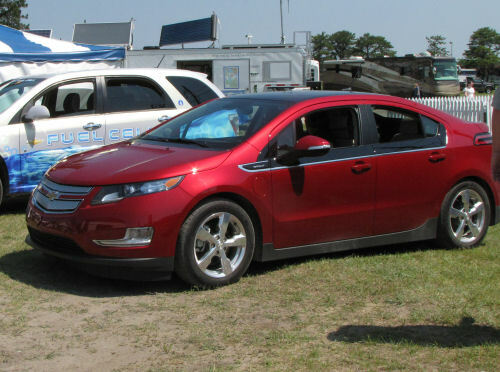 Finally, GM had a big display of the Chevy Volt. It does use both electricity and gasoline, but not in the same way as a Prius. It's always powered by the electricity. If the battery runs down then the gasoline is used to power a generator which creates more electricity for the power train. They had two of them on site- one for people to look under the hood and learn about the process, and one for people to take for a test drive! That was the red one, and I took a turn. I've never driven a Prius, but have ridden in a couple. The Volt was even more quiet, if that's possible. The ride seemed very smooth and it handled fine... what can you tell in a half mile? but it was fun. So that was my big excitement for today! Not a great photo. Dragonflies don't hold still very well. I'm pretty sure this is a female spangled skimmer, Libellula cyanea. Yes, that's "cyanea" as in blue. The males are blue, the girls get to be gold and black. The other choice is a female golden-winged skimmer. Here's why I think it's the spangled one. 1. The range of the golden-winged doesn't really quite cover where I live. 2. The wings really look black, not at all golden. 3. 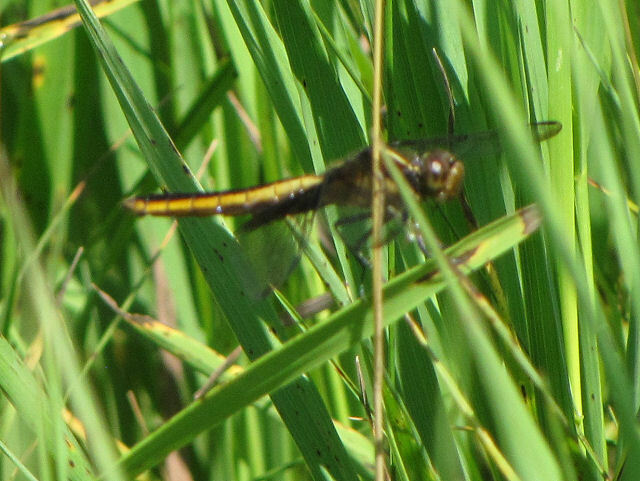 There were blue dragonflies also in the same area, which might be the males, while the males of the golden-winged ones are red. However, the spangled one should have both a black and a white spot on the leading edge of the wing. Maybe I can't see that because of the focus or the angle of the light. Anyway, this gives me something to look forward to... a better picture of this handsome dragonfly. 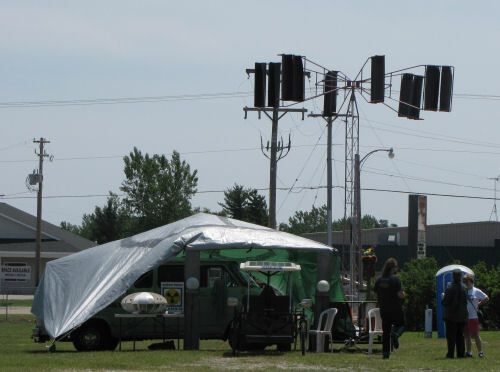 I volunteered at the Michigan Energy Fair today, but didn't get to see the exhibits. I'll be there again tomorrow, and should get to actually see some interesting things, and bring you pictures. Does Anyone Remember this Project? If you've been wondering what project I was working on since I finished Loretta's Shawl, here it is. I'll give you a minute to search your memory banks. Two of you may remember. Ivy chose the winning pattern. Ann submitted the winning pattern. This is destined to be a baby afghan that looks like a teddy bear. This is what I have done so far, and it shouldn't be any problem to get it done before Ivy's baby arrives. 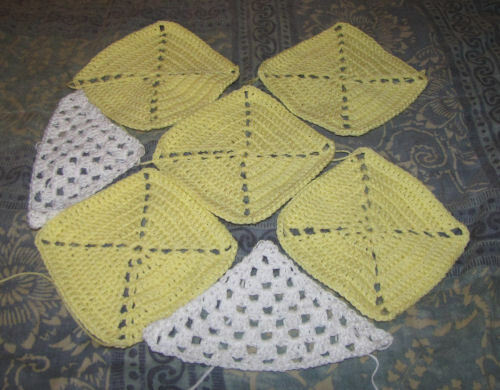 However, there are two potential issues: It's going to be a lot smaller than I think a baby blanket should be. How long does it take packages to get to the Philippines? Larger or not, this will be done really soon. So what should I make next? Of course I could try to FINISH one of my many projects packed in boxes. Maybe I should do roulette, or make you all choose which one to work on. Haha. Ellen and I sure picked the good day to play last week. It has rained all this week. A low pressure is parked over Michigan, and we are WET. With some help from BugGuide.net, I can tell you what these small creatures are. OK, we'll do the one some of you may not like so much first. 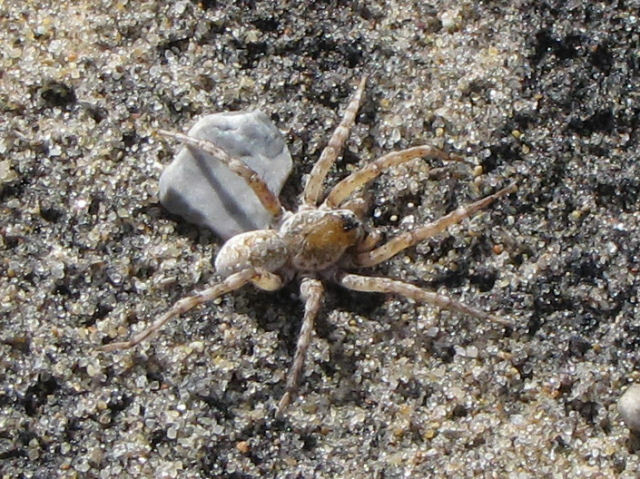 This is an unidentified species of Wolf Spider in the genus Arctosa. 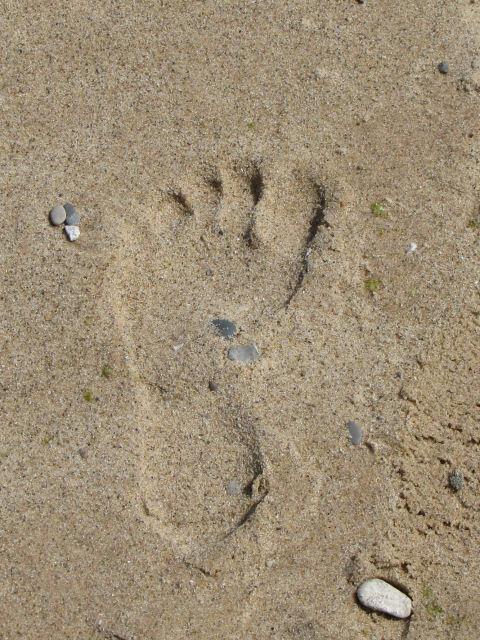 This one was scrambling around on the Lake Michigan beach. I was surprised that Bug Guide IDed it as a wolf spider, because I thought they were darker, with stripes, and some are. It's just that this is a different one. Clearly, I need to learn more about what makes a wolf spider: hairy, 8 eyes in a particular arrangement, long legs, note the shape of the cephalothorax and abdomen. Wolf spiders can bite, but they usually won't unless they are provoked. Bites can be painful, but usually not serious unless someone is allergic. Next up is someone much more cute. As I'm sure you will also recognize, this looks like a black lady bug, or lady beetle. Well, it turns out that is basically correct. The real surprise is that this is a Fifteen-spotted Lady Beetle, Anatis labiculata. So, where are the spots, you ask? 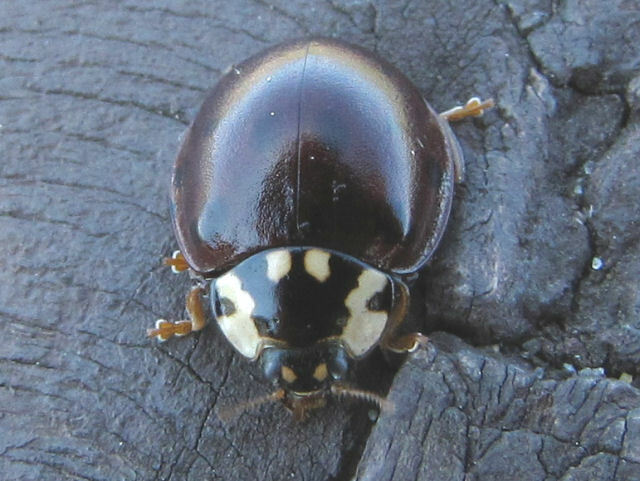 Unlike humans, who gain spots as they age, this beetle loses its spots. When they are young, they are gray with dark spots. This one is really old, with a solid purple-black case. Aren't the legs cute? Now I'm just going to have to look for a young one! 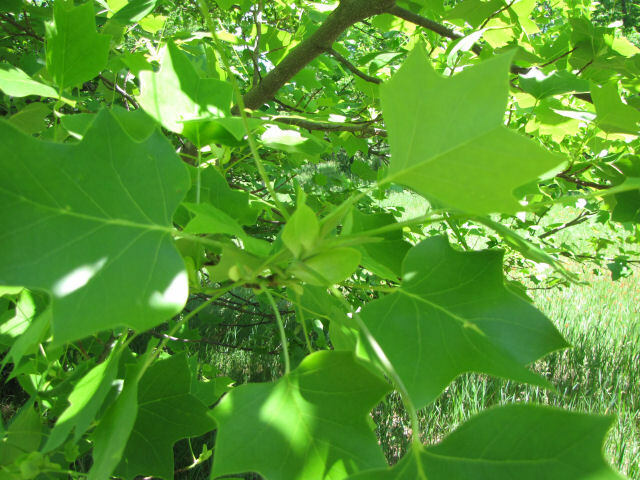 One of the places Ellen and I went on Friday was to check out my favorite Tulip Tree, Liriodendron tulipifera. I still haven't managed to get there at the right time to bring you the blossoms, but here are the lovely leaves. 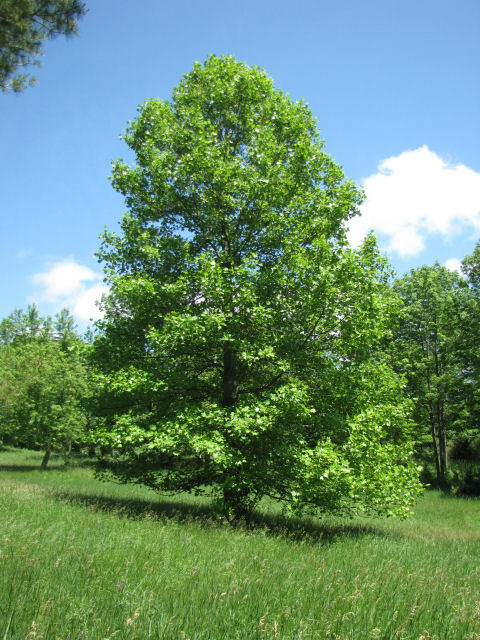 Here's the wonderful conical shape of the tree when it grows in the open. 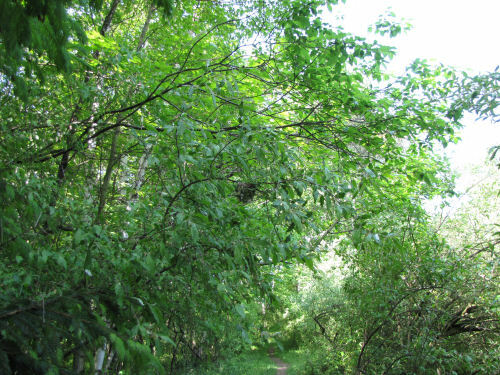 However, it's usually tucked into a forest edge. Here is one of the reasons it gets its common name. The leaves are shaped very much like a silhouette of a tulip. Isn't this bud fun? It looks like a sprouting baby garden plant. That would technically be called a cotyledon. It's a new leaf growing out of that cluster of leaves. And it's a native American tree. The wood is soft, and used a lot for furniture- usually for the insides of drawers. 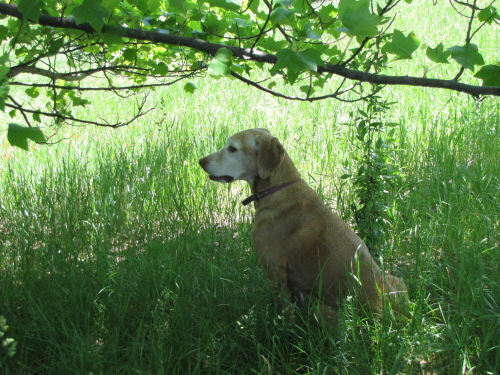 Maggie just says, "It sure makes some nice green shade. 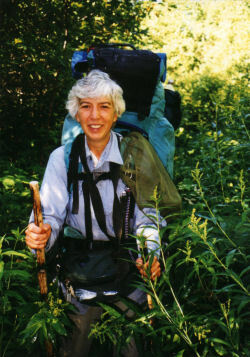 Nice walk, Mom and Ellen!" No Kitchenhenge, No Internet, How about a Fern? Did you miss me? Don't answer that! We were having severe thunderstorms last night and I didn't dare connect to the internet. It was still rumbling and crashing as I went to bed at 12:30. I've pre-dated this entry so it will be marked for the correct day, though. It was the first day of summer, but we haven't seen the sun in several days here, so I couldn't get a sunrise picture for kitchenhenge... I seem to miss the summer one for one reason or another quite a lot. However, I will bring you another fern from my walk with Ellen last Friday. This one is a cousin to the Intermediate Fern. In fact they can be easily confused, but I'll tell you the secret and then they are easy to tell apart! I've showed it to you before, but these are better pictures. 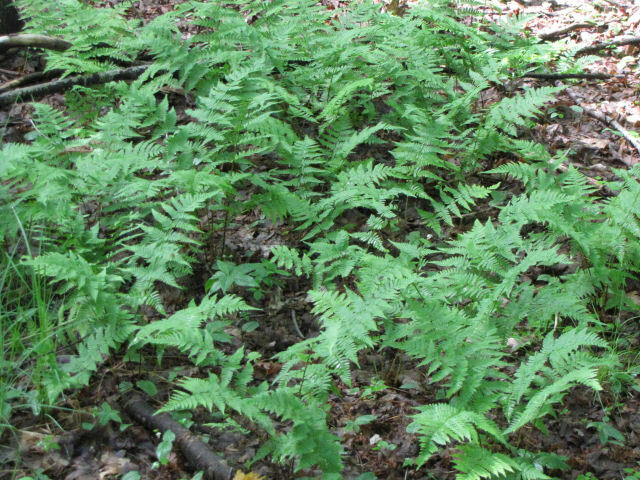 This is the Spinulose Wood Fern, sometimes called the Toothed Wood Fern, Dryopteris Spinulosa, or just to be confusing, Dryopteris Carthusiana. I guess in the UK it's called the Narrow Buckler Fern. Here's a whole, lovely patch of it. 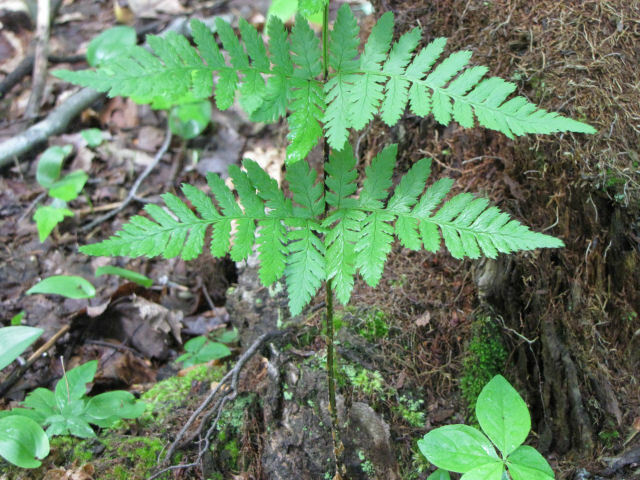 Here's the secret to telling this one from other wood ferns. Look at the lowest set of leaves (pinnae). Each little branchlet is called a pinnule, and you need to look at the two that are closest to the stem (rachis). If the second pinnule from the rachis is longest it's Intermediate Fern. But that's not true here, is it? You can easily see that the one closest to the rachis is longest. 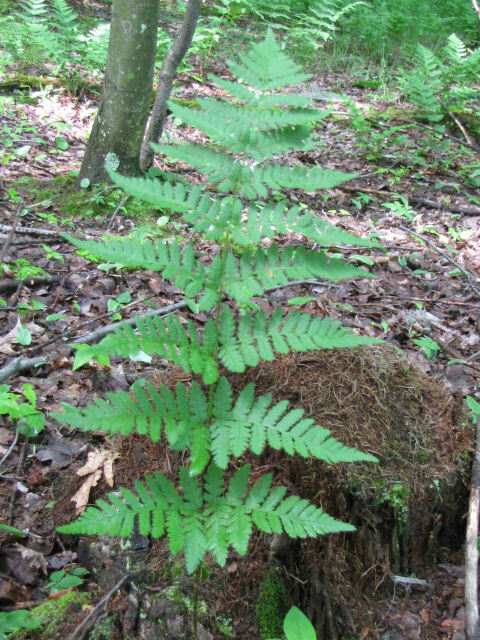 So it is Spinulose or Toothed Wood Fern, or Narrow Buckler Fern. More rain predicted for Wednesday! A surprisingly wet week so far. I decided (a little too late- but I got them all done) to go out and do work assignments this afternoon. Since we had a really heavy rainstorm this morning, my plans needed to change. So I headed out to chase down some more houses. I'm good with finding interesting plants too. 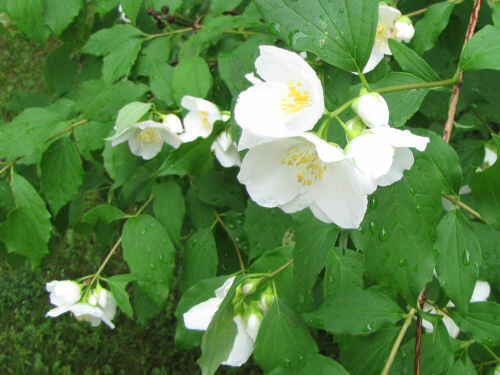 First up is an old-fashioned garden favorite called mock orange. I love the slightly creamy white blossoms, and they smell wonderful. I would love to have one of these bushes in my yard. At another place, I had to walk down 153 steps to the beach to see if they had a dock. 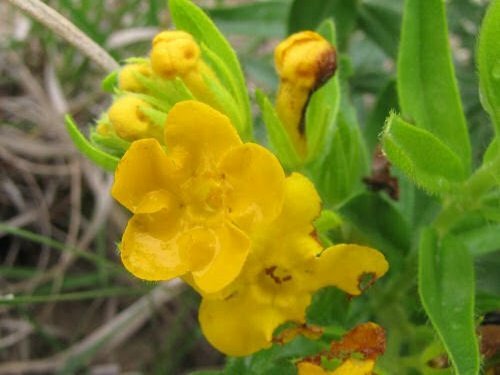 There I was rewarded with the hairy puccoon, a rare native wildflower of sandy beaches. This one had some insect damage, but I always think the color is astonishing. I really enjoy seeing all the lovely vacation homes. I get to drive through gates that say "Private Drive," to reach lakeside homes that cost a lot more than I've earned in a lifetime. I'm sure I can't share these pictures with you, but I don't think anyone will complain about sharing flowers. 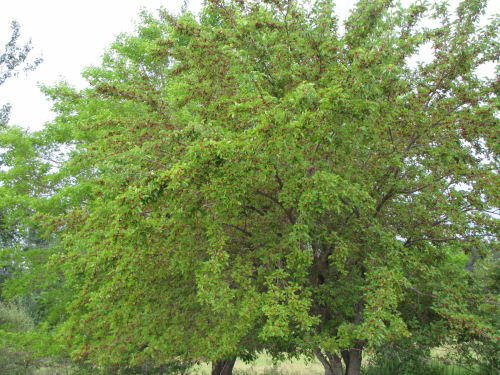 Actually, this is a small tree, and I'm sure it's not new to many of you. 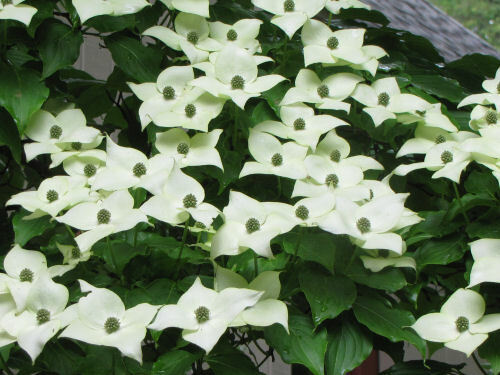 This is the kousa dogwood, a recently popular ornamental, but I hadn't seen one yet. It's really showy. It comes from Asia. I'm tired tonight... headed for bed. This is shaping up to be another busy week. All good. Sorry, couldn't resist another set that just appeared in my life this week. These are just common (and alien in the US) clovers. 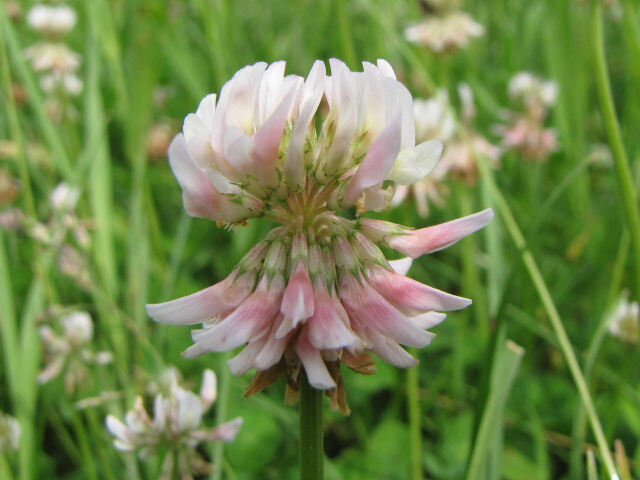 The white clover, Trifolium repens, is smaller, with the flower about 3/4 inch wide, sometimes tinged with pink. 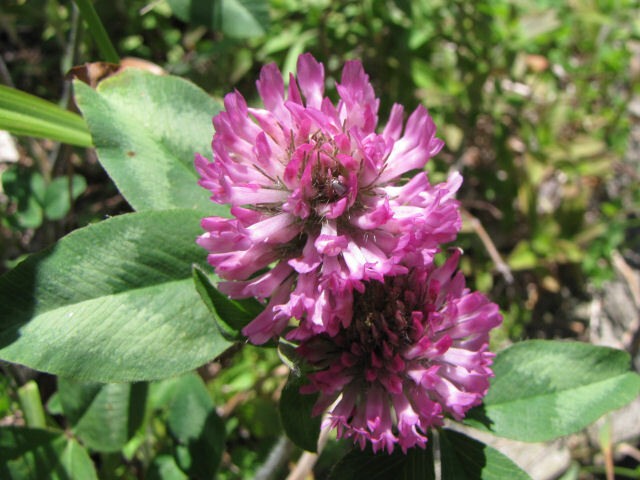 The red clover, Trifolium pratense, is larger. The fuzzy blooms are rounder, and may be over an inch across. 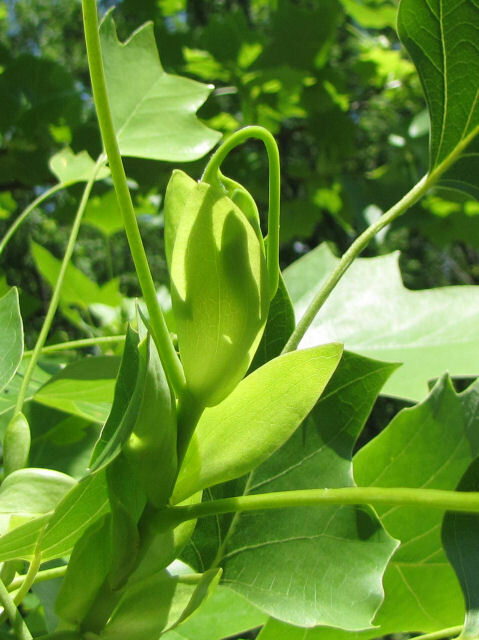 The leaves are large, with those odd white chevrons on them. "Trifolium" is an easy genus to remember because clovers have three (tri) leaves (folium). There are lots of clovers! 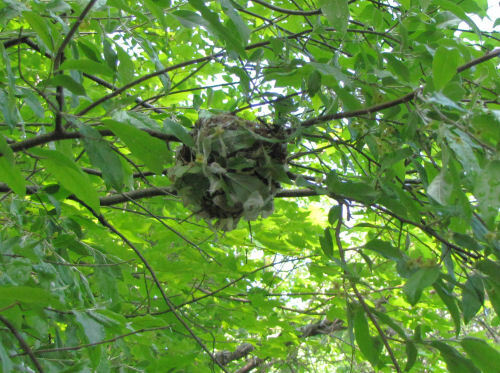 I have no idea who built this little home, but it's firmly attached to a branch of the horrible Autumn Olive. The whole thing was only about 2.5 inches across. Seemed a bit large for a hummingbird, but definitely had to belong to a very small bird. I love how tightly it's woven into the foliage. I carefully pulled the branch down to take a peek. The nest was empty, and judging from the hole in the far side, abandoned. The birds probably already hatched and fledged. I think it's adorable! 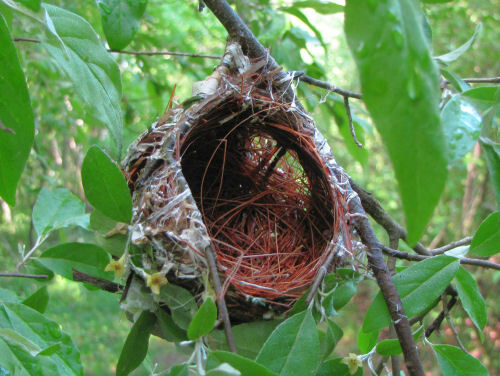 I really need to get that field guide for bird's nests. 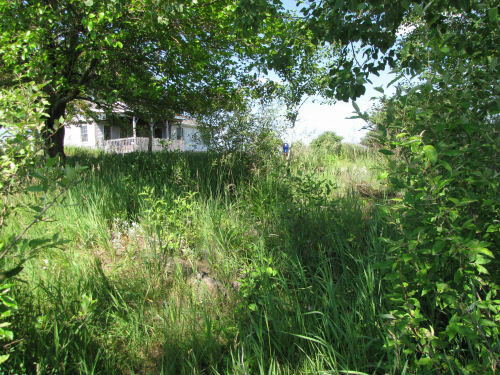 Maybe one of you real birder readers will know who lived here. 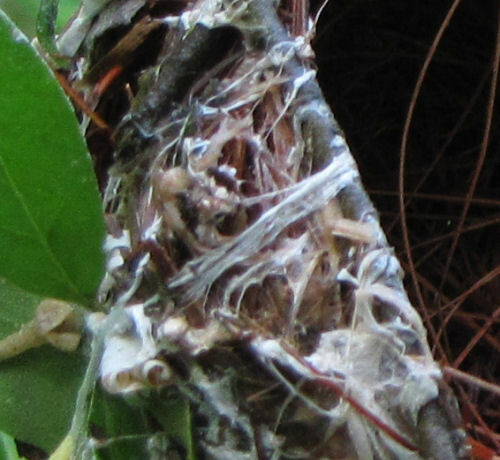 I've added a closeup of the "cord" that holds the nest to the branch, in case that will help with the ID. Ellen and I did a variety of things today. 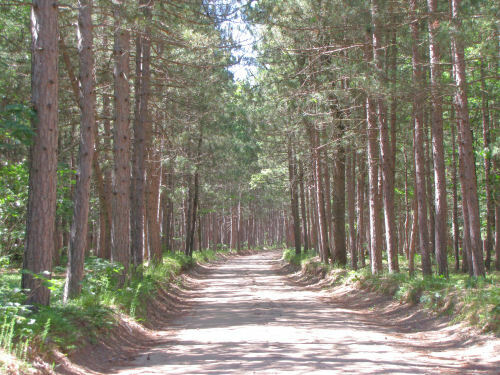 We headed toward Manistee and hiked three short trails for a total of five miles. There were so many different things we saw... I don't want to overwhelm you all on one day. You can expect to see tidbits over the next few days. After a chilly start to the day, the sun came out and made the lake (Lake Michigan is always THE lake) blue and appealing. This is the view to the south from Magoon Creek. You can just see some people on the beach in the curve. Then we turned and walked north. The view to the north shows you where we were headed next. 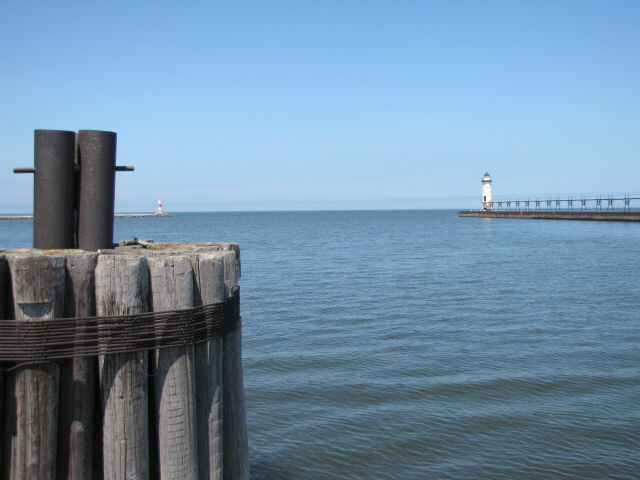 At the end of the next point of land is the city of Manistee. No, we didn't walk there. As I said, our total walking was only about five miles. Well, we did walk there, but not from this point. 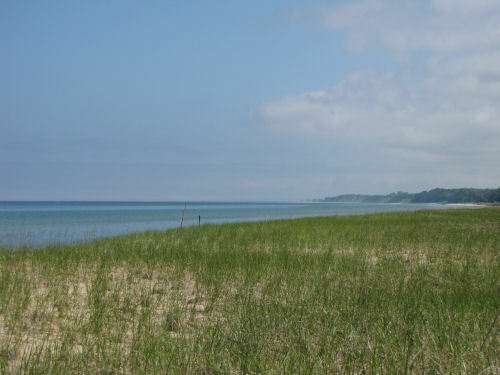 We took the car around to an urban trail (more on that another day), and walked to the Manistee channel into Lake Michigan. We sat in the park and ate our lunch. 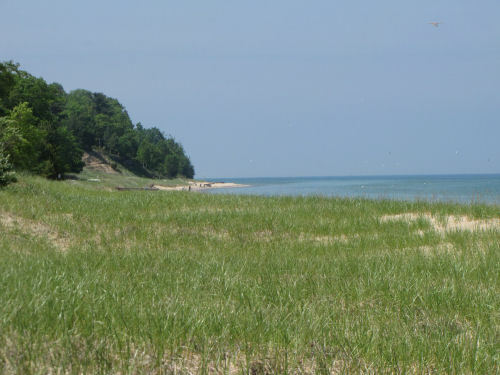 It's hard to beat a day along Lake Michigan when the temperature and sunshine are perfect, with a good friend. Don't I live in a beautiful place?